The above graphic shows the incredible potential of free energy delivered to us safely and uniformly over the planet. Renewable on the left, at an annual rate. Non-renewables on the right--total, for ever. Energy budgets are shown by relative size. 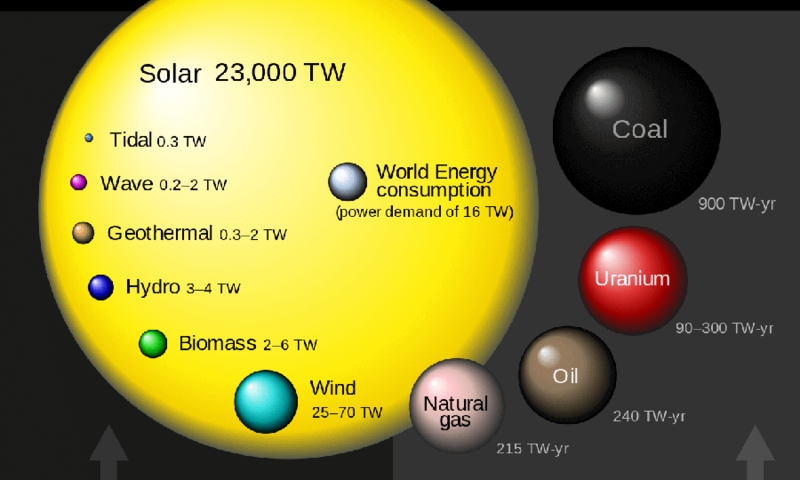 The big yellow circle represents an annual supply of solar energy from the sun: about 14,000 times more than we now use. All we need is the infrastructure to harness it. A smart grid, storage, energy efficiency technologies, and that is just the beginning of the clean energy economy. Jobs, national security, less pollution. We have the technology. We lack the policy and predictable market horizon. Otherwise this would have happened 20 years ago. We will make this transition eventually. The only question is will it be in time. As a leading voice in the investing and business community, Vanguard can help. Economists and the Intergovernmental Panel on Climate Change agree that pricing carbon is a concrete and cost-effective way to slow climate change. Bipartisan carbon pricing legislation is becoming concrete: The Energy Innovation and Carbon Dividend Act of 2018  has been introduced into the House of Representatives, and will help bring climate change under control by enacting a carbon fee and dividend into law. Many of the companies you invest in have already expressed support for the bill, including Gap Inc., General Motors, Schneider Electric, IKEA, and Unilever. I and my wife hold about $1M of Vanguard index funds. And I suspect Jack Bogle would be proud of them if they do this.